I wasn’t going to write anything more this week, but the latest shenanigans in Auckland have me chortling with laughter. 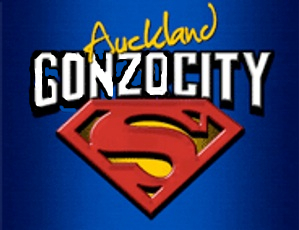 So-called Super City – you can keep it. A more disorganised bunch couldn’t be found. But then what can you expect if you have John Banks and Murray McCully in the same room, making decisions on the future of Auckland based on the needs of a rugby competition under two years away? So, what has happened in Auckland? How can the whole process have gone so swiftly off the tracks? How can one set of judges have chosen 8 contenders for the crown of Queens Wharf, only to have the whole process thrown out with no ceremony today? Auckland Mayor John Banks says the submissions were sub-standard. Auckland Regional Council chairman Mike Lee is also disappointed at the outcome of the design contest. �What we’ve seen so far doesn’t make the standard, it’s not good enough,� he says. Yes, part of the problem is the retarded nature of the initial competition itself. In exactly the same manner as the Te Wero bridge competition they held 2 years ago, which was a disaster and came to nothing, some munchkin in charge of the process decided to repeat the whole deluded process. The whole 2 stage process is clearly part of the problem, instead of being a useful safeguard as was intended. If you want carefully considered, go for this. If you want iconic world symbol, go for something else. But there is more to it than that. The brief was also muddled. What exactly was wanted? Yes, we want an iconic building. Yes, we want a long term Cruise ship terminal. Yes, we also want to keep some old sheds that are boring and ugly, but gosh, in terms of Auckland architecture, they’re not from the 1980s so they must be old. Yes, we want a place for drunken Poms to party in 2011 without upsetting the rich snobs in the Viaduct Basin. Yes, we want a cheap quick fix for about $20million, but also, yes, we want somewhere that Auckland will be proud of and can show off to the world. Yes, we forgot to tell you that, and yes, we might change the rules and the budget later. Yes, we want something big and pretty, and yes, ooh, don’t forget, it should have some maori and pasifika stuff in it as well cos we just remembered that we’re the biggest polynesian city in the world. Yes, we forgot to tell you about the iconic bit, but I mean, like, really, wasn’t that like, obvious? No, we won’t pay you for your work in the competition and we’ll lump the professional designers in with the school kids and the random nutters. Some of the best architects in the country, and all they could come up with was this crap? I agree with Banks and co – if the city is going to do something, do it properly and make it worthy. Get some overseas architects in to design it as all of ours lack vision – just have a look at the crappy glass, concrete, plaster and plywood examples in downtown. It’s surely an interesting turn of phrase from the Mayor that Auckland is in danger of “inheriting” yet another mediocre design. It hasn’t actually been built yet, so we can’t possibly be inheriting anything. This is instead, the deliberate future planning for mediocrity, not the accidental inheritance of it. If a suitable long-term design cannot be built within the budget and timeframe available prior to the Rugby World Cup, then surely the best course of action would be to erect temporary structures for that event, and defer the long-term investment until a better solution can be found. I am sure that for the purposes of the Rugby World Cup, a suitable “Party Central” could be made using Big-Tops, Superdomes, Marquees, and temporary grandstands etc, as is done for most one-off shows in Auckland such as the Easter Show, Ellerlie Flower Shows etc, all of which cater for huge numbers of patrons at relatively modest cost. Then sit down and re-think the budget and brief for the longer-term option, without the unneccessary time-pressure imposed by the Rugby World Cup. Monday October 5, 2009 I just dont get that we could be paying someone in China to design this. We are in a recession and ought to be supporting New Zealand talent. Also, in sport, it is devilishly hard to get funding for anything which requires payment overseas. The reasoning being the money should support new Zealand companies and economy. Remember the Craig Ross debacle with Rowing? It doesnt matter how much cheaper we can get something overseas if we are getting certain grant money in sport we must use NZ companies. The same goes for such a hugely public thing as this. Was the Sydney Harbour bridge designed in the USA? Thursday October 1, 2009 So once again instead of something unique and appealing, we, the rate payers of Auckland once again find ourselves on the end of a commitee designed horse.ie a camel, is this possibly a ruse and sop to the north shore community who were lumbered with a similar wharf masterpiece in the early ninties to ease them into the supercity thing with an “ours is worse than yours” type syndrome. Thursday October 1, 2009 Have you noticed? The eight shortlisted entries include architects. None of the comments of the jury panel includes the word Architecture. None of the 13 requisits for stage 2 of the competition includes the word Architecture. Thursday October 1, 2009 Will be interesting to see the views from the architecture community. No doubt they will be very political about it, and a couple of the bigwigs are there in the finalists so no doubt they will all be happy. I agree with Geoff – it is clear that in the end keeping at least one of the sheds was fundamental, and as others have said this is such a mediocre but typcially shortsighted approach. LOLZ! CAN I HAZ UR BAD DEZINEZ FOR TEH SUPA CITTEH? Once again the Standard Project Management triangle brings dullards to their Senses. Quality, well we would like something “iconic” bzzzt, sorry with the first two sides cast in stone, there is only one variable remaining, oh and did you say you wanted to keep the banana sheds, well OK, here is a pile of new lights, some pavers and a $hit load of paint stripper, go for it…….. you have less than 24 months….. It always amuses me that architects are the one design profession that is happy to work for free. What other creative professions preforms the very task that they are employed to do before they are even given the job? It definitely sounds like auckland has got a mess with their waterfront competition but we shouldn’t be patting ourselves on the back too much. 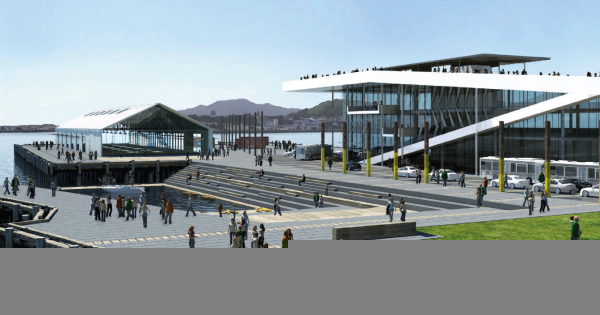 There are some things going on with the wellington waterfront competition and the entries that is not exactly on the up and up. 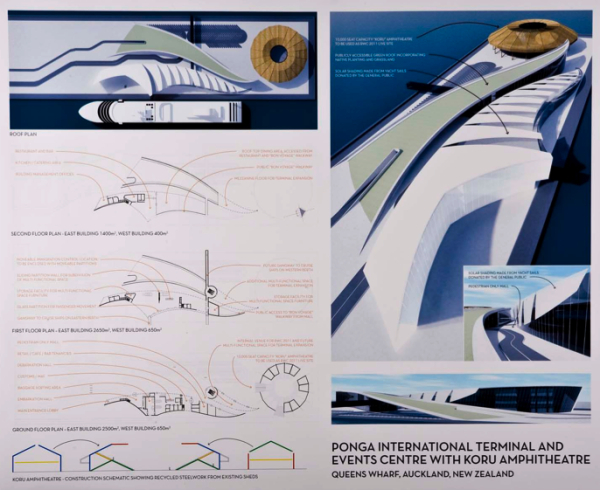 Wellington held the design compo for the Te Papa extensions not too long ago, and it was open to foreign architects. The winning entry was from UN Studio in Amsterdam, and it was a pretty good looker. The only problem now is how to finance the actual construction. Errr, wasn’t Te Papa designed by JASMAX? I’m pretty sure that they won the competition. Anyway, there are two sides to hiring a foreign design studio to do some local design. On the one hand, one could argue that as a foreign firm they won’t have enough intrinsic local knowledge and therefore the design won’t respect our culture, society, landscape, etc. On the other hand, one could argue that we are too close to the subject matter and can’t see the true nature of our society, culture, heritage, landscape and that what is needed is a fresh look from the outside. My personal view is that NZ is a very young country, as a society we’re teenagers. We don’t know what we want and even if we did we don’t know how to go about it. We suffer from from the complex of inferiority, we put ourselves down and are very quick to cut people down when they make mistakes (just look at our sports teams and how we treat them). We have some great creative talent in this country and for some reason it’s not coming through when these competitions are ran. Perhaps it’s the fear of being cut down or perhaps it’s just a national feeling of apathy and helplessness in the face of small minded politicians who are more interested in creating a legacy for themselves than in performing their civic and social duty to the best of their ability. They prove to us time after time that it doesn’t really matter what we, the citizens who elected them into office, think. Why would anyone be interested in participating creatively in such a depressing environment? Err, yes, Jasmax did design Te Papa, but DeepRed is right: the recent competition for a building to the east of Te Papa (not technically an extension) was won bu UN Studio. I have to disagree with you Tomek; I don’t think that being a young country cuts it any more as an excuse for our lack of cultural confidence (America’s founding document is only 64 years older than ours and they don’t seem to have any trouble in this area). The poor results in this competition have nothing to do with the depth of our creative talent (which is excellent) but is a problem of local bodies that have no idea how to run one. This could be attributable to a lack of respect for the creative talents of architects but this is speculation. There is also siginificant media pressure for a quick and quirky result; unfortunately this leads to a celebration fo the superficial and all hopes of depth disappear. WOW, wonderful writing, I’m in hysterics reading all of this….. it certainly makes entertaining reading. The sad looser is the quality of architecture and design. And the deep lack of understanding or experience as to what it really takes to create the conditions to allow brave, original, lonely ideas to emerge. Having won a series of major international competitions and also having been an international jury member it is interesting to reflect on New Zealand’s current dilemma. There is certainly a lack of serious commitment and respect for the work designers, architects and engineers and the enormous amount of passion, ideas and investment made by them in such a competition process. Being asked to do such work in three weeks is simply absurd, while the brief itself leaves much to be desired. For clarity for a project of this size it normally takes about a month to distill really good original ideas especially amongst a good multi-disciplinary team, before then really testing them out and developing them up into a well thought through and resolved design which often takes another month. But then there is the very different task of how best to present the design, and the production of the drawings, models, perspectives and text takes another good two to three weeks at least. In Utzon’s case it took him about six months to really distill his underlying idea – which is even now extremely radical and brilliantly appropriate to its site. But of course Auckland didn’t have time for that – or did it? An enormous amount of time and effort was spent discussing and debating how the competition should be set up, and of course it took about six months to do all of that….. interesting ! But I have only commented on the production process of an architect or designer, which assumes that the brief is clear well set up, fair, anonymous and transparent – including a clear statement of the judging criteria and the identity of the judges (neither were mentioned in the QW competition). Next, it is critical that a really good jury is chosen with the appropriate experience and knowledge, and that their decision is final – this must be taken very seriously – and can not be left to politicians. Auckland did not have a jury, their status was only as advisers who only reported to the heads of the various organisations involved who in turn then referred on to the politicians – this quite frankly is a complete sham. A professional Jury needs to be taken seriously ! Both competitions were not at all well organised or run, both mixed together a call for ideas from the public (in itself very good to do separately) only to confuse it with the very different task of choosing well resolved design proposals by designers. Both cities should reflect deeply on the lessons that we need to learn from these two competitions, and think more deeply about what it really takes to produce outstanding work, on really important public sites. It is clear that neither have unlocked the necessary conditions for a process in which something special, something original and truely uplifting could emerge. I was very fortunate to find this kind of environment that allowed the realisation of my own work in the Netherlands – the winning result of a major international europan competition in 1993 which was finally completed in 2003. The example that the Europan organisation together with the commitment of the municipality has set is quite extraordinary – and a good one to learn from. However there are many other good examples too, essentially it is all about how to create a nurturing environment that is committed deeply first and foremost in a wonderful, special and unique idea, which is then defended and supported through to its realisation. It is this kind of total commitment that has enabled the realisation of great works of architecture in the past such as the work of Antonio Gaudi, or Louis Kahn, or Alva Aalto, or Jorn Utzon’s brilliant Sydney Opera House, or Renzo Piano & Richard Rogers Pompidou Center in Paris, or Norman Fosters Hong Kong Shanghai Bank, or Foreign Office Architects Yokohama Terminal in Japan. In fact we have a much better and more accessible example which is much closer to home. As any parent knows their own kid needs to be supported and nurtured in order to flourish, in order to grow, and in order to have a chance in the world. Really good architecture is just like this – its not a quick fix, or something that is whipped up in a couple of weeks – as the ongoing work on the Sagrada Familiar church in Barcelona shows – the brilliant genius of both Barcelona’s Antonio Gaudi, and New Zealand’s Mark Bury have combined into a work of deep significance and originality. This quality that I am talking about which every parent invests in their own children is what it takes to open the possibility for this fragile miracle to emerge, to grow and to flourish – It is what Kevin Roberts of Saatchi and Saatchi refers to as ‘Loyalty Beyond Reason’ . it is now time to take architecture seriously. >Was the Sydney Harbour bridge designed in the USA? Technically, Tracey from Balmoral is correct because it wasn’t designed in the US. But it was designed and built by Dorman Long and Co Ltd of Middlesbrough, Teesside, and Cleveland Bridge of Darlington, County Durham. The Sydney Opera House was designed in Denmark. And Canberra was planned by an American. WOW indeed Chris Moller, that takes our record for longest comment. Ever. And sensible and well thought arguments as well. Thank you. Sounds like you know what you’re talking about – and it’s a damn shame you weren’t around to be involved in the judging of the Auckland competition – or the Wellington one either, for that matter. Hmmm. Maybe we should give you your own column? And kudos for Chris Moller to fisking the the organisation of these competitions and the NZ local/national government bodies attitudes towards them. Quite a few, actually. I worked in IT & design businesses for quite some time, and when you’re pitching for work you put in a huge amount of unpaid time in the hope that it will land you a lucrative job. I imagine that the same thing occurs in fields as diverse as advertising, construction and creative writing, and in fact anywhere that there’s an RFP, proposal or submission process. Chris, do you have a link for that 2018 europe policy? It seems very radical, but I dont see how it would work when the availability of wind/solar energy is limited. I also dont understand why micro-generation is necessary. Surely utilising the economies of scale present in wind and solar farms would be much more efficient, and thus much more green? Tom, I definitely know the pain of spending large amounts of unpaid time to win work. However, in my experience, this process is usually concerned with planning the project or demonstrating the viability of your plan, and is still slightly different to what architects do in competitions. I love the UN studio winning entry. Such a pity that there were no funds available at the time of the competition finishing. Sometimes, but in my experience a succesful pitch often involved mocked-up interfaces, research of new concepts, partial proofs-of-concept and test databases, in addition to the elements you mention. 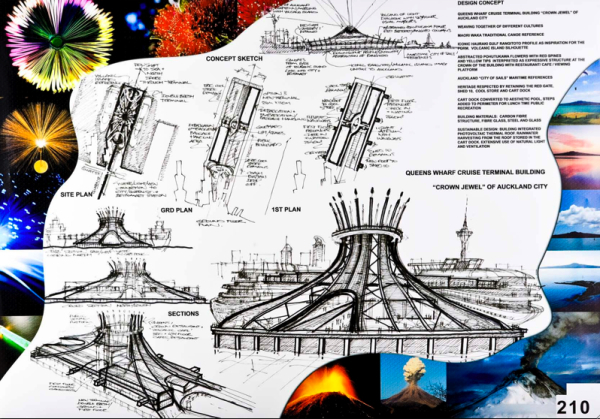 In concept and proportion, it might be comparable to an acrhitectural practice putting in a few hundred hours of work to come up with conceptual designs and some indicative plans & renders for a competition, knowing that if they win there will be vastly more work to produce an actual building. One would assume that what’s important to architects are environmental concerns and urban design. But it’s not – what’s important is magazines and awards. It’s “iconic”, has the “wow factor”, photographs beautifully, gorgeous. Being a glass box sans eaves it appears to completely ignore any environmental concerns, with a blank wall on the street it appears to ignore the most basic urban design principles. But it looks sooo good so lets stick with what’s important. but also for an earthquake prone country like new zealand – makes sense, if we have major earthquakes, that we don’t rely on everything going down all at once. The current copy of the Listener magazine has an excellent comment by Hamish Keith, the “Cultural Curmudgeon”. I’m guessing that is to differentiate himself from Joanne Black, who seems to be the non cultural Curmudgeon. Anyway, column worth reading – reproduced here thanks to the Listener. Buy their magazine. But read and discuss here. So that was decided upon. Three weeks later, the 200 entries were pinned up around St Peter�s Square. The winner was a painter and decorator and part-time builder from Florence, Mike Angelo. He got to work, and in time for the Pope�s big day Rome had another iconic building and the Western world one of the greatest works of Christian art. Before there are great or even good public buildings, there is great and good public thought. Popes and pharaohs, kings and prime ministers who have left great monuments clearly thought about them first. Why did our Cabinet ministers and local body politicians think they were exempt from that essential first step before setting out to litter Auckland�s waterfront with bland modernism or faux-Polynesian follies? They gave it no thought and in return got nothing worth having. A sad and mindless process that seems to endlessly repeat throughout the land. We generally have appalling urban design because we have almost no urban vision to build it on. Before building something that could even aspire to greatness, there needs to be absolute clarity about what it is for. Not a soul in charge of Queens Wharf had any idea what the project was for � vague yearnings for an after-match piss-up would not cut it. Nor would the Ports of Auckland�s cunning plan to get a cruise ship terminal the city would pay for while slipping the Ports $40 million for the privilege. Where this sad tale is no longer the same old same old is that the politicians saw the light at the 11th hour and called it off. What might happen next is not quite so clear. But a great big think about what Auckland actually might need on the middle of its city waterfront would be a sensible place to start.